Solid wood furniture made from natural materials with a respect for nature. Tiger maple, cherry and walnut modern wood furniture. Mokuzai Furniture is born from a love of wood and a respect for the beauty of nature. When the tree is cut and then sawn into workable slabs, there is always a moment of awe. The artist sees the wood in its natural form, sees the history of the tree in the grain and sees all the beautiful forms and colors that were held within its trunk. WHAT WILL IT BECOME? WHAT PURPOSE WILL IT SERVE? WHAT WILL THIS TREE SPEAK TO ITS ADMIRER? Mokuzai is solid wood furniture. Our modern wood furniture is created entirely from premium hardwoods. Each piece of Mokuzai Furniture is 100% solid wood. There is no plywood, no pressboard, no veneer. 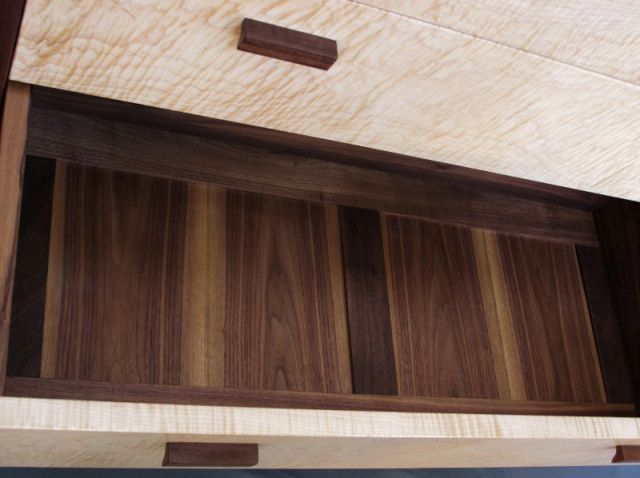 Even the interiors of our drawers and the backs of our cabinets are made from beautiful wood. Our customers comment that they wish they could leave our dresser or cabinet in the middle of the room because the back is as wonderful as the front. ARTISTIC BEAUTY, INSIDE AND OUT. We are committed to producing as little waste as possible. We recognize that trees are a precious resource. We are respectful of the gift from the earth that each tree is and we make sure to layout our designs in a way that keeps waste at a minimum. The minor amount of cut offs and trimmings that are left are used to help heat our home. We even use the collected dust and shavings to compost beautiful soil for gardening, or for mulch and ground cover on the paths in our backyard woods. WE ALL HAVE JUST ONE EARTH. Our velvet-touch, hand-rubbed finish preserves the natural colors of the wood. We create our modern wood furniture from three different woods. We use walnut, cherry and tiger maple. Each of these woods offer a different color and grain pattern, giving you many options for cordinating with your home decor. The finish for our furniture is done with natural oils, varnishes and waxes. The specific product we will use on your piece of Mokuzai Furniture will depend on the wood choice and the intended use of the furniture. We do not paint the wood, we do not stain the wood. The wonderful colors and patterns you will see in our furniture, are all from the natural wood and are only enhanced by the finish.